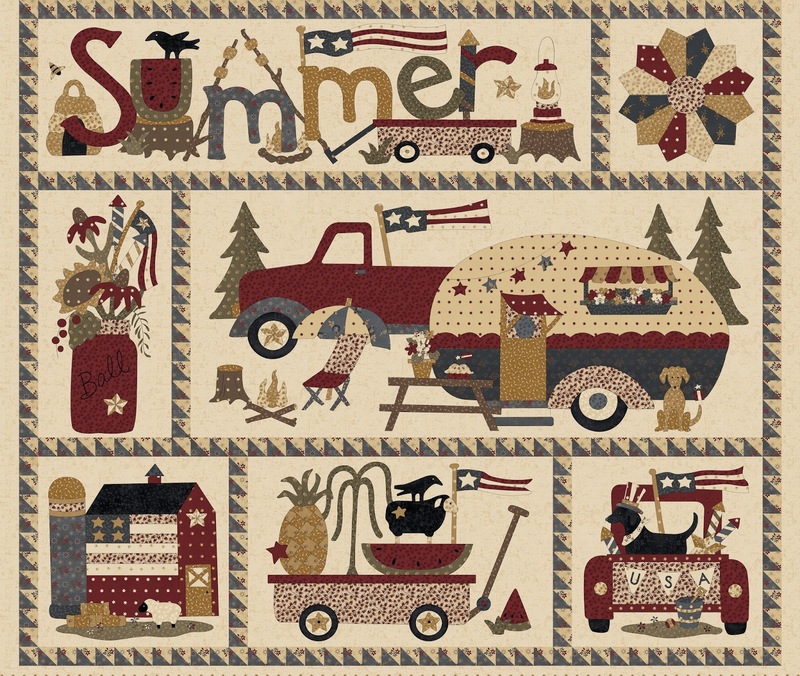 Meeting Stacy West in person is NOTHING like the slow-paced laid-back style of her folk art designs. The patterns of her company, Buttermilk Basins, evoke a quality of days gone by, where life was at its finest when you had time to set on the front porch and stitch away at a project that seemed like it was just part of your lap for the better part of a month. Meeting Stacy feels like you are on a rocket ship headed to the moon! Put your seatbelt on because it’s going to be a wild ride. The energy of Stacy is palpable as she commands presence with her graceful yet wielding power. 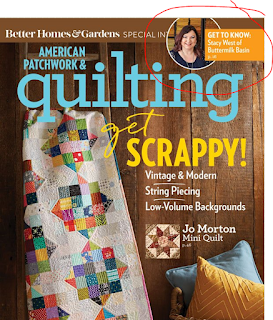 I first met her at her Buttermilk Basin booth at the Spring Quilt Market in St. Louis. It was an incredible booth packed to the brim with ideas, projects, inspiration, themes, and people. This is very much how I might picture the inner workings of her brain. And what a cute name Buttermilk Basin is too! The name came from how inspired Stacy has been by the life of her Grandmother. Her Grandmother lived to almost 101, and grew up in the era where she hauled water, got milk from cows, and she always had buttermilk in the fridge, hence the name Buttermilk Basin. Stacy has come from humble beginnings and worked her way to being a respected designer in numerous mediums. She is an artist at heart and is not afraid to step out of the box to try new things. She has designed rubber stamps, licensed her designs in the gift industry, designed logos, and identity systems for various shops in the past utilizing her education in graphic design. Henry Glass Fabrics has chosen Stacy and Buttermilk Basin to create a new line called “Spirit of America.” Stacy has taken this design opportunity to marry cotton, yarn-dyed dobbies and wool together in a cohesive collection of quilt shops to carry that will enhance and the many projects that Buttermilk Basin already has to offer. One of the first things I noticed about Stacy was the size of her online audiences. 20,000 on Facebook, 5,400 on Instagram and a pretty impressive number of followers on YouTube. Stacy is quick to speak of her audience as her friends. Stacy says, “I teach a lot of classes, travel to a lot of shows, and I meet a lot of people who have genuinely become friends of Buttermilk Basin.” Stacy is a self-described chatty gal, and over the course of 15 years since her business began, she has chatted with a lot of ‘friends’ who are now dedicated followers. And she rewards them too! Every month on her media platform she has giveaways, introduces new products and has a Mystery Block of the Month with a free pattern download that builds to create an awesome project by year’s end. Stacy also has a strong personal drive. She does not believe in failures... only learning lessons! She is inspired and most importantly, has a work-ethic that keeps her moving from task-to-task leading the charge in all facets of her business; design, manufacturing, sales, marketing and operations. Buttermilk Basin is both an online and a brick and mortar business. In her 2,200 sq. ft. shop she hosts workshops, events and offers a variety of mediums including wool, cotton, yarn dyes, fibers, patterns and kits to her customers. She also brings in women from around the country (and as far away as Australia) to her WOOLSTOCK event which is a bi-yearly 3-day event held at the shop. She is the only teacher that teaches two days of workshops, one day of make-it take-its along with a trunk show and the event culminates in an evening party. So, yes, Stacy is a kind of a big deal! 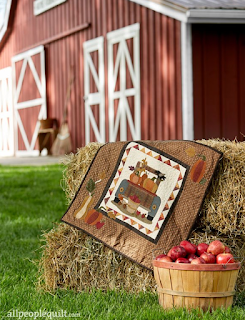 In 2015, she made it to the top 3 in Martha Stewart’s American Made challenge. 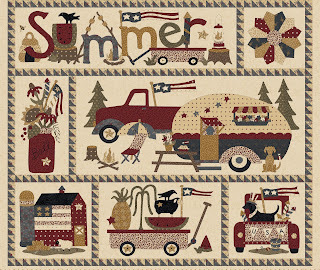 You will see Stacy featured in various magazines including Simply Vintage, Quilt Mania, Better Homes & Gardens Special Interest Publications, The Wool Street Journal, Primitive Quilts and American Patchwork & Quilting. 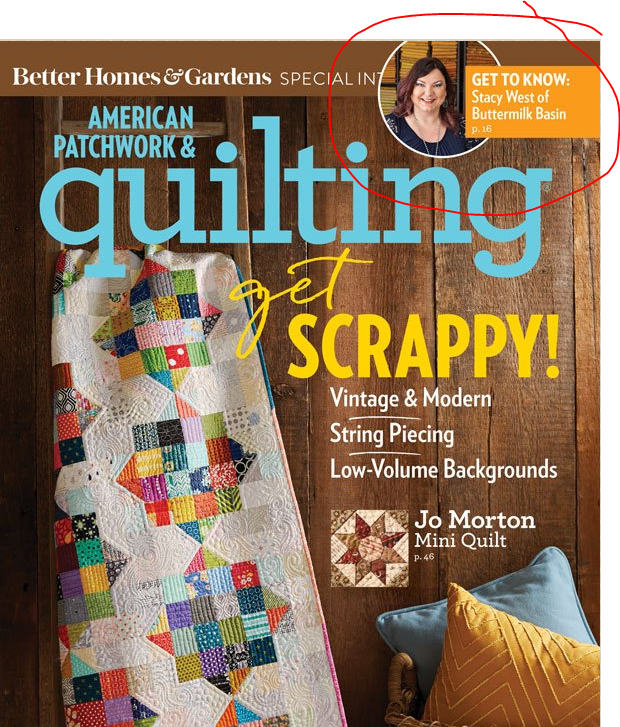 American Patchwork & Quilting® magazine. ©2017 Meredith Corporation. All rights reserved. Very nice ty for sharing your ideas..